What if I told you that that casserole up there had a whopping 28% of your daily value of iron per serving? Would that amaze you? And behind curtain #3 there is a washer/dryer combination that will blow your socks off. Ha! No, I'm not talking about iron from MEAT - this is VEGGIE iron that Popeye used to use to save Olive Oyl from disaster. That's right - spinach! Frozen spinach is a cheap and easy way to get many nutrients with zero preparation. You just thaw it, squeeze it, and add it to anything. Because this recipe includes spinach, it has 280% of your daily value of vitamin A, 83% of your vitamin C, and 50% of your daily value of calcium. How can you go wrong? These are SUPER good for you AND they are enchilada-like (a new word I have come up with). They differ from the real thing because I have reduced the number of tortillas and I didn't use any meat. Sorry carnivores! You can keep all of the ingredients in your pantry for one of those nights that you didn't have time to shop for groceries. If you don't like chiles - leave them out. My kids find it too spicy with chiles (which is sad because I love spicy food). Also, to reduce the sodium which is primarily due to the enchilada sauce and tortillas - use low sodium salsa. Tortillas can be packed with sodium - so look for low sodium tortillas if you can find them or make your own see: homemade whole wheat tortillas. For the Weight Watchers crowd, this recipe could easily be 6 servings which would reduce the Points+ number to 6. When you compare these spinach corn enchiladas to the REAL ones you will be amazed at how many calories you saved by skipping the meat. Do you have a healthy take on enchiladas? Please share. Heat oven to 375 F. Thaw spinach in microwave and squeeze out excess liquid. Add spinach and corn to large bowl and mix with 1 cup cheese and chiles. Spray a 9x13 casserole dish with non-stick spray and spread spinach mixture evenly in dish. Add tortillas, spread sauce on top of them, and add 1/2 cup left over cheese. Cook for 15 minutes and enjoy! Thanks for all of your recipes!!! This one sounds delicious but I have two questions: doesn't the presence of dairy in the cheese decrease the absorption of the iron in the spinach? And secondly, do the tortillas not get a bit crunchy on the edges? Spinach has high levels of oxalate. Which hinders the absorption of iron. One source I found states that we only absorb about 15% to 20% of the iron. The real health benefits are the other nutrients found in spinach. Let's hear it for frozen veggies!! Rumor has it that they are often frozen very near the field in which they are grown, hence having kept many nutrients! And if they make it easier to serve lots of veggies, how great is that? I'm trying to get over my own bias!! Love it! I;m actually making enchiladas tonight!! Now I cam excited too!!! Making this over the weekend. Will be giving this a go, love spinach, would make it tonight but got to head to the grocer and pick up more tomato sauce first so I can make my own enchilada sauce. Canned has way too much sodium for me :) Thanks for the recipe!! That looks good, I do love enchiladas! 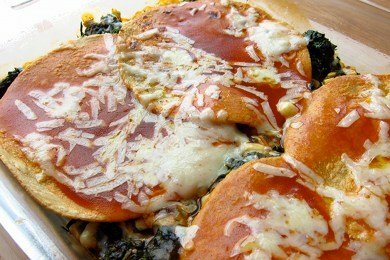 I love frozen spinach too, it's easy to add and I think spinach goes with a lot of things. This looks great!!! Thanks for the recipe! I froze the surplus of my CSA shares last summer, so I am enjoying lovely veggies from there as I await a new season. I think I'll try this with kale and summer squash . . . I think I could use some cabbage ideas, too . . . I love enchiladas this way. So much easier than rolling them up individual. This looks yummy, Snack Girl. Regarding absorption of nutrients, the oxalates in spinach do affect the absorption of iron and other vitamins and minerals, although because the spinach gets cooked, the absorption improves somewhat over raw (raw has other upsides over cooked). Both are great. Love the recipe, but I'm disappointed that you want to compare these to "real" enchiladas. Enchiladas don't have to have meat, even in Mexico. These are just as real. Black beans, by the way, would be great in these and they are chock-full of iron.